Thomas R. Williams is a professional speaker who works with you to create the message that matches your goals. We spend an enormous amount of time understanding the client’s needs for our services, to ensure that we meet their expectations. We focus on the relationship with the clients and develop follow-up game plans so the momentum built during the presentations can be long lasting and effective. This program is designed to ignite your business teams. Inspiring them to maximize their full potential. Thomas’ messages are specifically tailored to the companies specific goals. His interactive engagements will leave the audience feeling “pumped up” and excited about their role on the team. Each member of the audience will feel moved to rethink their own goals and challenge them to take action. Thomas’ ability to connect with your company is what makes him an authentic speaker. While playing at USC Thomas played on 2 national championship teams and played in 4 Rose Bowl games. He has experienced competing at the highest level for football. After suffering a career ending injury he is now focused on helping your student-athletes prepare for life after sports. Inside of the Player Development program, Thomas Shares with your student-athletes the importance of finding an IDENTITY outside of their sport. He teaches your student-athletes to embrace their TRANSFERABLE SKILLS that makes them successful long after the scoreboard has turned off. He has a dynamic way of educating each student-athlete about CAREER DEVELOPMENT and the importance of NETWORKING and how relationship building plays a huge role in the success of an individual’s future. This Player Development program is specifically designed to help student-athletes understand and utilize their status as an athlete. This tailor-made program focuses on life after an athletes career, long before the transition. Thomas brings a dynamic presentation to your school. Sharing with your students the power of having a plan for their lives. Thomas shares his story of how he went from a troubled kid with no hope for his future to how he pursued his passion and earned an athletic scholarship. Over the past few years, Thomas has worked very close with the United States Military. Especially the Wounded Warrior Units. During this presentation, Thomas talked directly to the subject of "transition". His program is tailored to speak to the soldiers, reminding them that they already have what they need to get everything they want once they transition out of the US military. 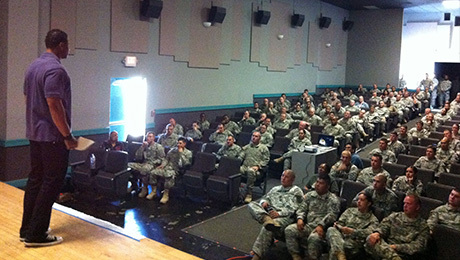 This program is designed to help soldiers identify their transferable skills so that they can utilize them in civilian life. Get more information, book a speaking engagement, or ask other general questions.